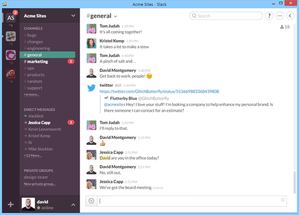 Popular business-communication tool Slack has finally got on board with Windows. The well-funded start-up just released a desktop app for Windows 7 and up (including the Windows 10 technical preview). Slack is part of a new generation of business-focused communication tools that function as all-in-one messaging platforms. Instead of spreading your team across instant messaging apps and email, Slack wants to replace both with capabilities for quick or long-form messaging, and the ability to easily attach files for others to access. The impact on you: Slack already offers a Mac app as well as apps for Android and iOS. Prior to the new desktop program, Windows users were stuck using Slack's web app. That still enabled Windows users to communicate with their teams and get notification alerts, but it wasn't perfect. Users participating in multiple teams on Slack, for example, would need a separate browser tab open for each team. The desktop app does away with the need for multiple tabs and allows you to switch between teams with the left-hand navigation panel. The app also adds desktop notifications that are tailored to match the visual theme each team is using. Finally, Slack, like many Windows apps, will run in the background with an icon in the system tray to let you quickly fire it up again. Adding an official Windows app into the mix was a long time coming for Slack. The company says more than 30 percent of its users are on Windows. That's a big chunk of users without a desktop app—albeit a relatively small Windows user base, especially for a business app. Current Slack users can download the new Windows app directly from Slack's site. Non-Slack users who are curious can try out the new app for free with no restrictions on team size, but with a limit of 10,000 archived messages.